Fantastic service from Tracey and team when selling my much loved MINI Highgate. All done in a few hours. Have just bought a 2013 MINI Cooper Convertible from Tracey. She was fantastic to deal with and really easy to contact. She really goes the extra mile and is available outside usual office hours. As I was travelling from Cornwall I needed to be able to trust what I was told about the car - there was never any doubt in my mind that Tracey was completely honest. She even arranged her colleague to meet us part way between Lightwater and Cornwall with the car! So pleased with my MINI and would definitely recommend Mrs MINI to anyone. We recently purchased a 2006 MINI Cooper from Tracey, the process was easy and hassle-free. Car was one of the best I\'d seen for the age and we have been enjoying driving it over the last few weeks. Would recommend Mrs MINI and hope to use again in the future. The whole process was brilliant. You could tell straight away she sold quality cars and took care of them and cared about what she was selling and wanted to give someone something they would love. Tracey was very understanding with my situation and held the car for me without deposit and turned business down because she trusted me and kept to her word. I will deffinatley be using Mrs MINI again for either a new car or servicing. 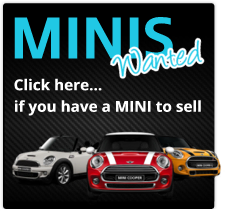 Just bought our second MINI from Tracey, this time for my daughter\'s upcoming 21st. As was the case on our first purchase, Tracey went the extra mile to ensure a satisfied customer, which in this case included MINI logo stickers for the wheel trims. My daughter is over the moon with \"Brenda\" and we\'ll definitely use Tracey again. Collected my new MINI Clubman (Connie) from Tracey 2 weeks ago and loving her more everyday. We brought our yellow convertible auto MINI from you and wanted to send a THANK YOU for everything you have done to ensure our car is perfect. All the very best from your Lincolnshire customers!